The Children’s Place, a children’s apparel retailer, uses StitcherAds to drive sales on Facebook & Instagram. StitcherAds automated the most challenging aspects of prospecting to drive 9x ROAS. We love how quickly StitcherAds is able to innovate and adopt new features. StitcherAds got us into the alpha test for Facebook’s broad audiences. Compared to the results we see with retargeting, we were shocked that prospecting campaigns could deliver similarly high return. 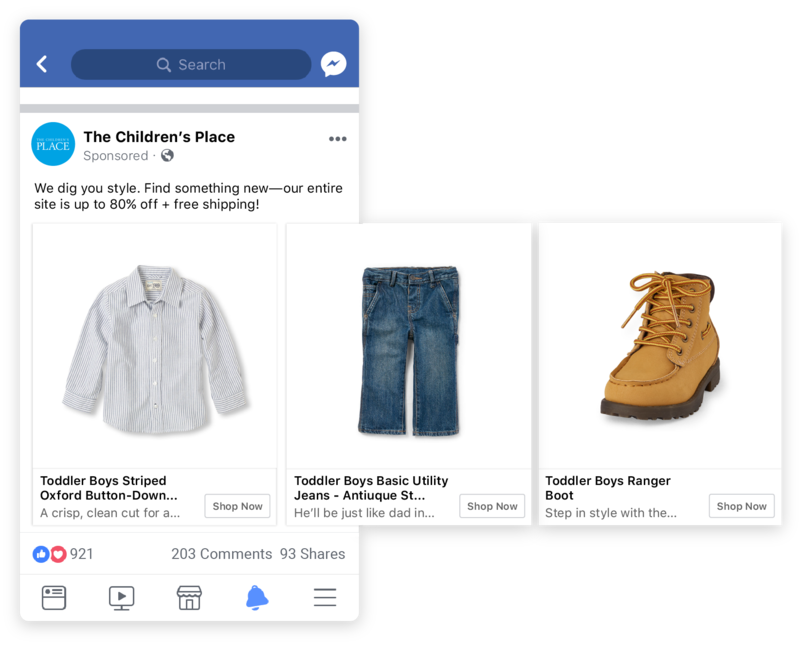 The Children's Place had primarily used Facebook for retargeting, finding success through the StitcherAds platform in recapturing bounced users and abandoned carts. But they weren't running campaigns to capture new business. Similar to StitcherAds' dynamic solution for retargeting, TCP wanted an automated solution for prospecting on both Facebook & Instagram. Upon the alpha release of Facebook's new broad audience targeting, StitcherAds connected with The Children’s Place to see if they wanted to expand the scope of their automated ads past website visitors. With TCP on board, StitcherAds ran a dynamic ads campaign with broad audience targeting, expanding to new audiences that hadn’t previously taken action on their site, without loss of content relevancy. Dynamic ads to broad audiences drove a 9x ROAS. The Children's Place prospecting campaigns actually outperformed their retargeting program, meaning new customers converted better than site visitors that had already indicated intent to purchase. Finish Line uses StitcherAds for new growth, resulting in 49x more sales. With StitcherAds, retailers boost prospecting performance through in-store data.